It’s hard to believe it, but Christmas is over. In the blink of an eye, done. But I didn’t set foot in a Walmart even once. Oh, I was tempted, believe me. There were a few times I wanted something and I knew Walmart would have it. For example, I bought a lovely bottle of brandy, just for kicks, and wanted some brandy snifters. I couldn’t find them anywhere I had normally been shopping. Namely Target. I tried Big Lots and the grocery, both of which had a lovely selection of glassware for the holidays. I was sure that the mall stores had glassware, but I’d been to Eastview once and wasn’t at all interested in fighting the traffic to go back. But Walmart? They’re open 24 hours a day. No traffic at 10 PM, right? In the end, I went to Bed, Bath and Beyond and found a very lovely set off four brandy snifters for $20. And I felt pretty good about that purchase. So here I am with less than a week to go in 2010, and now that Christmas is behind me I can start thinking about the new year and my plan for adventure. The big question: if I’m going to live like I believe what Jesus taught is actually true, what should that life look like? 31 days without Walmart – holiday spending up over last year and that’s a good thing? The results are in, and according to comScore.com, holiday spending in the first 35 days of the November-December 2010 shopping season is up over 2009. I have to wonder when we think that it’s a good thing that we’re spending more money on stuff we don’t need when unemployment is so high, foreclosures are commonplace, and poverty is rampant around the world. We live in a consumer driven, disposable society. We buy, we use, we throw away, we buy more, we use more, we throw away more. And we celebrate the whole cycle. Perhaps the most disturbing statistic this year is that retail sales increased 28% over 2009 on Thanksgiving Day. Thanksgiving Day? Aren’t we supposed to be gathered with family on Thanksgiving Day, giving thanks for health, family, freedom, and all of the other wonderful things we’ve been blessed with over the year? Instead, stores opened and shoppers headed to the mall to pick up bargains. Bargains for which I’m sure they were thankful. But it’s not the same thing. I confess. I went to Big Lots to get tins to ship cookies. Forgive me consumers, for I have sinned. I went to a StuffMart. Not Walmart, but just as bad: Target. And OK, Big Lots. As you know, last week, I went to Big Lots to get tablecloths for my husband’s family Christmas party, saving at least $7 on a disposable item. But I’m trying to avoid discount stores at all costs, in the interests of going 31 days without a StuffMart. 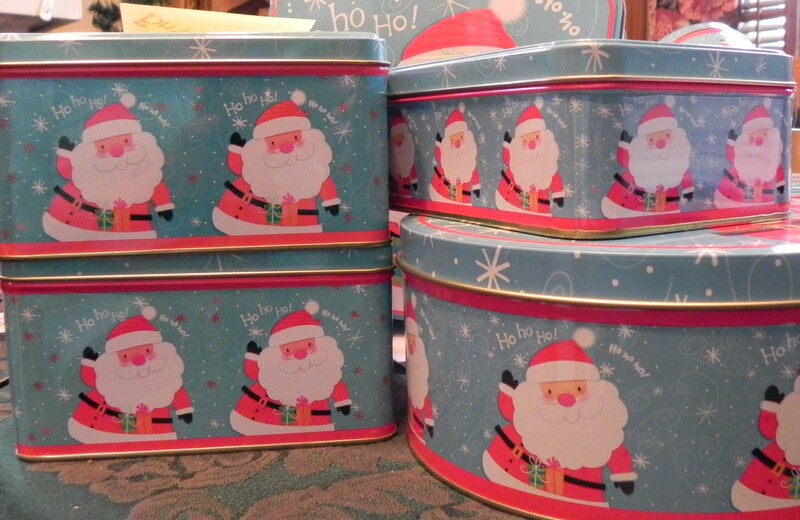 But yesterday I went to Big Lots to get Christmas tins to ship cookies and other edible treats. I knew they had them cheap; I didn’t even look at the labels, but yup, they’re made in China. I didn’t even think about it. I needed something I knew they had inexpensively, so I went there. I was on autopilot. Today, I’ve been on a quest to find something to keep the chicken waterer from freezing. I started at Country Max but couldn’t afford a heater ($52) and the heated dog water bowl is too deep. So I thought I’d try Beyond Hardware, the local hardware store. Which just happens to be in the Target plaza. I figured if Target had a heated dog water bowl it might be cheaper than the hardware store. I confess, it was tempting to go check out the discount clothing racks. And I had to shield my eyes as I went by my biggest temptation: the book section. I did make two purchases: a bottle of Aveeno fragrance free body wash and a box of Feline Pine cat litter that was on sale. Things I need at prices that saved me little money. I feel a little guilty; normally, I’d get the Aveeno at Walmart (same price) and the litter at Wegmans (a dollar or two more since what I got at Target was on sale). So I’m avoiding Walmart and going to Target instead? Kind of defeats the purpose of the experiment. And I’m not out of either of those items. I didn’t need to buy them. But I am proud of myself for not getting distracted by shiny stuff. No clearance racks of clothing I don’t need, no books to add to the huge pile next to my bed. In the end, I didn’t find anything that I could use to keep the water from freezing in the henhouse. I have a 250 watt heat lamp in there already; I just lowered it closer to the metal waterer and am crossing my fingers that the stupid chickens don’t think I just gave them a new swing. As for the Big Lots tins: I bought more than I needed, because I didn’t want to have to go back. Hopefully, I can return what I don’t use. So I spent $0 on what I needed, and about $15 at Target on two things I will need eventually. And about $25 on a bunch of tins to ship goodies for gifts. Yesterday was my husband’s annual family Christmas party, and I took part in the Secret Santa gift exchange. 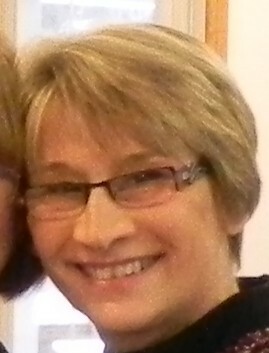 This is my husband's Aunt Kathy. I picked her name in the Secret Santa gift exchange. Because of my “31 days without Walmart” project, I needed to get a gift somewhere other than the StuffMart. As I wrote last week, it would have been easier and more convenient (and certainly less tempting) to just do everything at Walmart, but in the end, also less special. I picked my husband’s Aunt Kathy and went to Mostly Clay on Schoen Place in Pittsford for a gift. I love this store, owned by Margie LaTourette. Years ago, I used to own a tea shop in the space below hers and we’ve remained friends ever since. For Aunt Kathy, I picked out a piece of pottery from Sommerville Pottery. 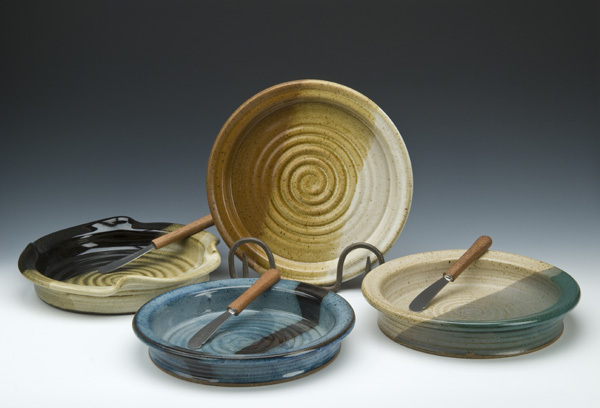 It’s officially called a ‘brie baker’, but it’s a round, rimmed plate that can be used to serving hors d’oeuvres or as a small tart or pie pan. Very functional, very pretty, and locally made. When Aunt Kathy opened her gift and saw “Mostly Clay” stamped on the box, she asked if there was something actually in there from Mostly Clay or if I just resused a box. When I told her that indeed there was a gift from the store in there, she got excited. Apparently, she loves that store! And she explained later that she used to have a dish much like the one I gave her. But it broke and she’s missed it every since. I got Aunt Kathy a 'brie baker', essentially a pottery dish that can be used for lots of things, made by Sommerville Pottery on Keuka Lake, NY. She seemed genuinely pleased with the gift, which made me happy. Sure, I could have gone to Walmart and gotten a scarf or gloves or something else in the price range. And I’m sure she would have loved it. But instead, I got something with a personal touch, got to see my friend and support her business, and really think about the gift I gave.